YARMOUTH — Join us on Friday, Sept. 14 from 5:30-7 p.m. as we celebrate the opening of the Stonewall Gallery’s fall show, “Rough Seas and Healing Skies”, by Yarmouth artist Margareta “Meta” McDonald. Wine, cheese and light refreshments will be served at this free opening reception. True to the title of the show, McDonald’s paintings encompass atmospheric ocean scenes and brightly lit landscapes as well as sprightly still lifes. She has found inspiration in the landscape around Yarmouth and further afield in places like Monhegan. Born in Stockholm, Sweden, McDonald studied math, physics and chemistry before embarking on a teaching career that took her all over the world. 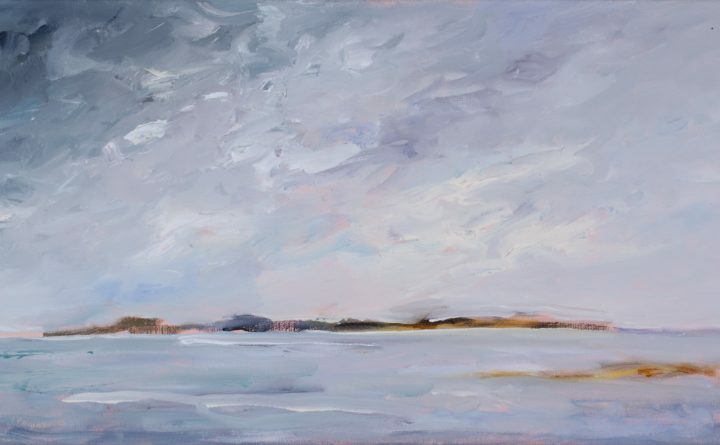 She began studying art formally at midlife, embracing painting fully after retiring to Maine. Her work has been shown internationally as well as locally, including a recent solo show at Merrill Memorial Library. “Rough Seas and Healing Skies” by Margareta “Meta” McDonald will be on view at the Stonewall Gallery through Oct. 27. The Gallery is located inside the Yarmouth Historical Society, 118 E Elm St.